With the mission of supplying better products and services to all citizens in the world, Citizen Co., Ltd is one of the largest watch manufacturers who responsible for 22% of the world total watch production. In 1918, a Tokyo jeweler, Kamekichi Yakamazi started the Shokosha Watch Research Institute producing pocketwatches. In 1924, the first commercial model was produced under the brand “Citizen”. Citizen is one of a few companies whose names were not given by their founder. This name was given by Mr. Shinpei Goto, the mayor of Tokyo. At that time, making a pocket watch in Japan was very difficult. This name represents the desire of turning it into a common and popular item with all citizens all around the world. But it is not until 1930 that Citizen Watch Co., Ltd was founded with Yosaburo Nakajima appointed as the president. In 1936, the first wristwatch was completed. The very first wrist watches of Citizen required daily touch with their users as the coil needed winding manually every day. In 1936, Tanashi factory was constructed. Since then, the company began expanding beyond the borders of Japan by exporting its watches into Southeast Asian and the South Pacific market. Due to the eruption of the World War II the Japanese economy geared itself to support the military, in 1941 Citizen started producing machine tools. After the World War II, Japanese industry was ruined with terrible loss. As well as the whole country Citizen had to rebuild. In 1945 the president position was taken by Shinji Nakajima but not long after that, it was taken by Eiinchi Yamada in 1946. Under his management, the company achieve significant growth rate. This success is contributed by Citizen trading Co, a subsidiary established in 1949, responsible for marketing, importing and exporting. In 1952, the first Japan-made watch with calendar was introduced. Thanks to great effort, Citizen was able to resume export to other countries such as China, Southeast Asia, America and Europe. The timepiece industry in Japan was then dominated by four companies: K. Hattori (we know as Seiko today), Citizen, Ricoh and Orient. In 1965, Hattori and Citizen produced more than 80% of Japanese watch manufacture. Along with Seiko, Citizen has also made breakthrough in the history of watch production with these inventions: Japan’s first shock resistant watch released in 1956, the first wristwatch with an alarm in 1958 and Japan’s first water resistant watch in 1958. Japanese timepiece manufacture experienced a hard time in early 1960s. Ricoh and Orient’s watch making area decreased and resulted in their loss in status as watch makers. The market was monopolized by two main competitors, Citizen and Seiko. In order to survive and avoid direct competition with Seiko, Citizen decided to diversify its product range: In 1964, technology research laboratory was established; at the same year, Citizen Business Machines was started. A year later, Citizen began producing business machines (Adding machines, camera shutters). In 1967, Citizen Jewelry was established (this subsidiary was merged with the mother company later). In addition to broadening their product range, Citizen also extended their overseas market. At the end of 1965, they opened an office in former West Germany and started exporting full-fledged timepieces to Europe which was a real challenge to compete the reputation of Swiss horology. After this period, along with watchmaking, Citizen has gained a lot of success in the field of precision machinery and machine tools. They successfully acquired the German machine tool maker Boley G.m.b.H. Nowadays, more than 50% of the sales figures are based on precision equipment, robots, computer units, printing machinery, LCD, quartz oscillators, jewelry and healthcare products. 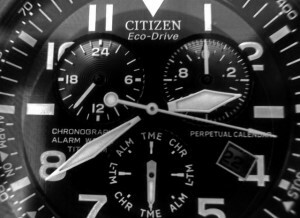 One of Citizen’s best products is their Eco-Drive systems. As their names, they are environment friendly as there’s no need to change batteries. It was breakthrough in the history of watch manufacture in Japan so it was given the Japan Environment Association’s Eco Mark for environmentally friendly products. Models with Eco-Drive system helped Citizen overcome the slump caused by the proliferation of cell phones. They are still popular in North-America and accounted for one third of Citizen’s revenue in 2000. However, in the time of booming technology, Citizen has to adapt by adding new features to their timepieces. In 2003, they introduced the World’s first full metal case radio-controlled watch with a built-in antenna. Although watches are not the main source of revenue (about 40%), Citizen is well known for their horology and stay one of the world’s leader in manufacturing watches.